MORE THAN READY (USA) (Bay 1997-Stud 2001). 7 wins-5 at 2, Saratoga King's Bishop S., Gr.1. Leading Aust. Sire of 2YOs twice. Sire of 2381 rnrs, 1747 wnrs, 190 SW, inc. More Joyous (ATC Queen Elizabeth S., Gr.1), Catholic Boy, Sebring, Prized Icon, Phelan Ready, Benicio, Roy H, Samaready, Verrazano, Entisaar, Rushing Fall, Room Service, Regally Ready, Perfect Reflection, Dreamaway, Uni, Eagle Way, More Than Sacred, Perfectly Ready, etc. Gala Miss (f. by More Than Ready). Winner. See below. Keirabella (f. by More Than Ready). Winner at 1200m in 2018-19 in Aust. KISS AND MAKE UP (More Than Ready). 2 wins at 2, A$215,025, ATC Todman S., Gr.2, Tab.com.au P.
Paris Match (Street Cry). 2 wins at 1200m, 1400m, A$152,810, ATC Hyland Race Colours H., 2d Gold Coast Bracelet, L, ATC Swim Between the Flags H., Little Caesars Pizza H., Hyland Race Colours H., 3d ATC John Ramsay H., 4th ATC Adrian Knox S., Gr.3. Six Penny. 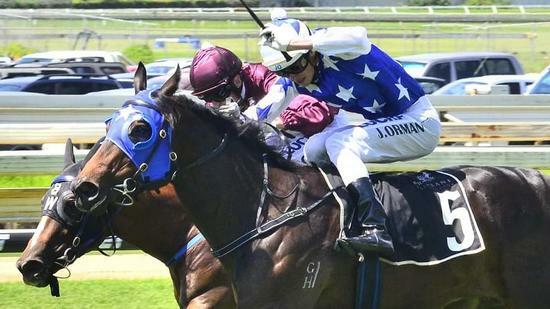 2 wins at 1000m, 1100m in Aust. Far Afield. Placed at 3 in 2018-19 in Aust. FASHIONS AFIELD (Redoute's Choice). 6 wins. See above. Reef Beach (Danzero). 8 wins-1 at 2-from 1500m to 2100m, A$206,150, S$115,480, VRC Shamrock Travel H., MRC Le Pine Funeral Services P.H., Singapore TC Zurich S., MRC Kenvain H., St Jude H., Paris H., MVRC Business Network Luncheon H., 2d VRC Auckland Racing Club H., L, Keith Greig H., MRC Greater Dandenong Chamber of Commerce H., Scobie Breasley H., Always There H., VRC Bill Kneebone H., Singapore TC Benchmark 97 H., 3d VRC Bridie O'Reilly's Punt H., Comedy King H., MRC Brian Green H., Singapore TC Shin Min Cup, Open H.-twice, VRC Gala Supreme H.
Riviera. Winner at 2 in 2017-18, MRC Ladbrokes Odds Boost Exotics 2YO H.
Xpressmymind. Winner at 2 in 2017-18, CJC NZB Insurance Pearl Series 2YO H., 2d CJC NZB Insurance Pearl Series 2YO H., Petersens Jewellers 2YO H.
RUNWAY STAR (Northern Meteor). 6 wins at 1000m, 1200m, A$386,030, SAJC Proud Miss S., Gr.3, Matrice S., L-twice, ATC Ladbrokes.com.au H., MRC Sportingbet Quick Multis H., 2d ATC Cellarbrations H., VRC Indian Summer H., 3d SAJC RN Irwin S., Gr.3. Twist My Heart (Dayjur). Winner at 6f, 2d Colonial Downs John Marsh S., L. Producer. Race Record: 2 Starts 1-0-0 A$59,450. Winner at 2 in 2018-19, BRC Lion's Pride Building 2YO H., 4th BRC Calaway Gal S., L.